A few years ago, I came across what is now known as a strange map of Africa. Not so much about Africa itself but putting it in a kind of perspective in comparison with other countries in order to disabuse the view of Africa being out there, out of sight and homogenous. The blog Africa Is A Country attempts to send up the impressions that tourists and workers to Africa, especially from NGOs give about Africa, but there comes a time where some basic enlightenment is useful. However, this detail is hardly effective if one does not catch a visual side of the real comparisons which is where the map below comes in. The map is quite apt for many reasons because most of the people I have heard from that say they have visited Africa even though it might have one of three major destinations being Egypt, South Africa or Kenya have hardly seen Africa. It was the Europeans that colonised most of Africa, Americans that do get to travel besides their economic or military influence are likely to be missionaries if they go off the beaten path or belong to some NGO helping fight one of Africa’s many ills. The Chinese have been coming to Africa and it is estimated over 1,000,000 have set up home in Africa, the reception of the Chinese varies between great excitement and serious foreboding. India, Incredible India just allows for those who have been there to know that it is just about a tenth of the size of Africa though with a similar population size. In the end, I hope that this map just helps put Africa in perspective, it is not a country and even within the 54 countries there are nations, tribes, languages, traditions, cultures and much else that might be the topic for another write-up. 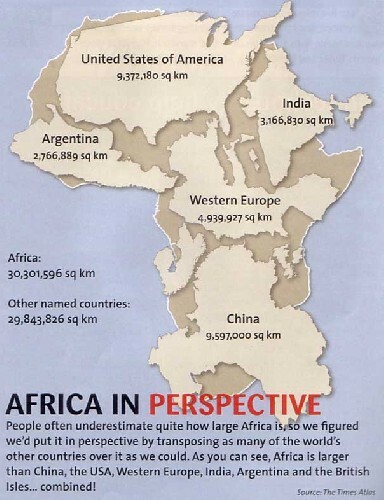 Just take in the wonder of the size of Africa for starters. Thank you.